Morphine is the principal constituent of opium and can range in concentration from 4 to 21 percent. Commercial opium is standardized to contain 10-percent Morphine. In the United States, a small percentage of the Morphine obtained from opium is used directly (about 15 tons), while the remaining amount is converted to codeine and other derivatives (about 120 tons). Morphine is one of the most effective drugs known for the relief of severe pain and remains the standard against which new analgesics are measured. 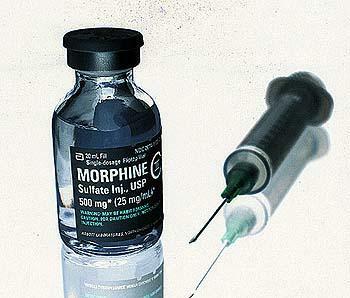 Like most narcotics, the use of Morphine has increased significantly in recent years. Since 1990, there has been about a 3-fold increase in Morphine products in the United States. Morphine is marketed under generic and brand name products including "MS-Contin®," Oramorph SR®," MSIR®," Roxanol®," Kadian®," and RMS®." Morphine is used parenterally (by injection) for preoperative sedation, as a supplement to anesthesia, and for analgesia. Morphine is the drug of choice for relieving pain of myocardial infarction and for its cardiovascular effects in the treatment of acute pulmonary edema. Traditionally; Morphine was almost exclusively used by injection. Today, Morphine is marketed in a variety of forms, including oral solutions, immediate and sustained-release tablets or capsules, suppositories, and injectable preparations. In addition, the availability of high-concentration Morphine preparations (i.e., 20-mg/ml oral solutions, 25-mg/ml injectable solutions, and 200-mg sustained-release tablets) partially reflects the use of this substance for chronic pain management in opiate-tolerant patients. Raw Morphine (Opium) Morphine is a highly addictive substance, both psychologically and physically. Its abuse potential is among the highest of all drugs known to man. Compared to other narcotic pain relievers, such as codeine, hydrocodone, and oxycodone, morphine is considerably more liable for abuse and dependence. More potent narcotics, such as hydromorphone and fentanyl, have high abuse potential, but still less than that of morphine. Only heroin, which is nearly identical to morphine, is comparable in dependence liability. Physical dependence and withdrawal symptoms can appear after only five days of administration. In a Japanese study, mice, which received morphine (10 mg kg-1 s.c.) twice a day for 5 days showed withdrawal syndromes such as jumping, rearing and forepaw tremor following naloxone challenge (5 mg kg-1 i.p.) on the 6th day. Such mice exhibited a significant elevation of cyclic AMP levels in the thalamus compared to control mice. Brown University Professor Julie Kauer and colleagues found as little as a single dose of morphine could contribute to addiction. A single dose of morphine can block a process in the brain associated with learning and memory for as long as a full day after being ingested. In a study, researchers found long-term potentiation, or LTP, is blocked in the brains of rats given as little as a single dose of morphine. The drug's impact was very powerful, with LTP continuing to be blocked 24 hours later -- long after the drug was out of the animal's system. The withdrawal symptoms associated with morphine addiction are usually experienced shortly before the time of the next scheduled dose, sometimes within as early as a few hours (usually between 6-12 hours) after the last administration. Early symptoms include strong drug craving, watery eyes, insomnia, diarrhea, runny nose, yawning, dysphoria, and sweating. Restlessness, irritability, loss of appetite, body aches, severe abdominal pain, nausea and vomiting, tremors, and even stronger and more intense drug craving appear as the syndrome progresses. Severe depression and vomiting are very common. The heart rate and blood pressure are elevated. Chills or cold flashes with goose bumps ("cold turkey") alternating with flushing (hot flashes), kicking movements of the legs ("kicking the habit") and excessive sweating are also characteristic symptoms. Severe pains in the bones and muscles of the back and extremities occur, as do muscle spasms. At any point during this process, a suitable narcotic can be administered that will dramatically reverse the withdrawal symptoms. Major withdrawal symptoms peak between 48 and 96 hours after the last dose and subside after about 8 to 12 days. Sudden withdrawal by heavily dependent users who are in poor health is occasionally fatal, although morphine withdrawal is considered less dangerous than alcohol or barbiturate withdrawal.